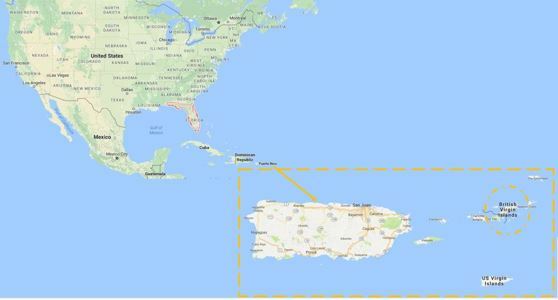 The British Virgin Islands is 60 miles due east of Puerto Rico. The islands are 2 hours from Miami and 3 hours 30 minutes from New York. Cape Air & Seaborne both code share with American Airlines so you can book your connecting flights on one ticket through American Airlines. Delta, American & Spirit fly from US cities to St Thomas. From the airport you take a short taxi ride to the ferry dock where you then take a 1 hour scenic boat trip to Tortola, British Virgin Islands. You can also use Cape Air from mid December 2013 to fly directly to Tortola. British Airways and Virgin from London - via Antigua and onwards flight for 1 hour with LIAT airline. Air France from Paris - St Maarten and onwards flight for 30 minutes with LIAT airline. Note: EU, US & Canadian citizens require a Passport and return ticket to visit the British Virgin Islands. Visas may be required for other countries, please consult your Local Embassy if in doubt.